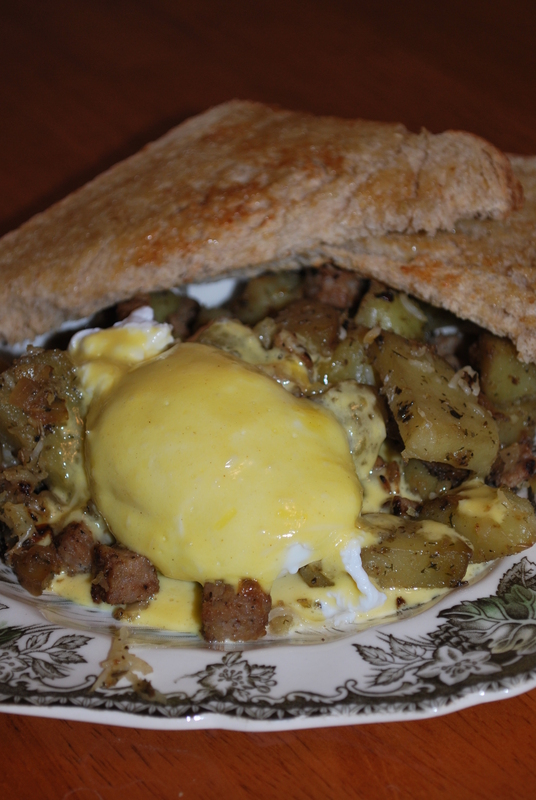 Maple Sausage, Potato and Eggs Benedict with Hollandaise Sauce – Live. Simple. Good. Once potatoes are nearly done cooking melt 1 tbsp. butter in a sauté pan and add the onions. When they begin to soften, add the maple sausage in small pieces and continue to sauté until the sausage is fully cooked or warmed (if using pre-cooked patties). 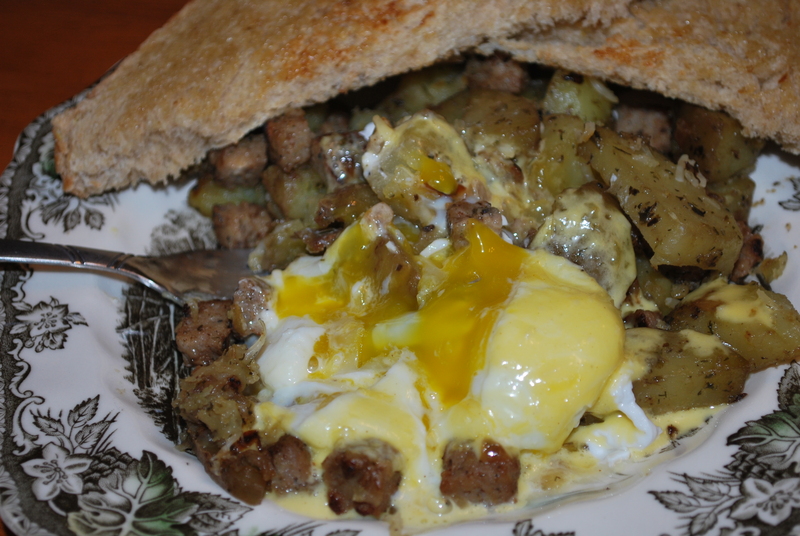 Toss the cooked sausage and onions with the already prepared hash browns. Sprinkle with Parmesan and garnished with parsley, if desired. In a blender combine the egg yolks, mustard and lemon juice for only a few seconds. With the blender on medium speed, slowly pour in the hot butter in a thin stream. The sauce should thicken quite quickly. Pulse in the Parmesan cheese at the end. Pour into a bowl and keep the bowl warm in a warm water bath while preparing the other components of the Eggs Benedict. Fill a 10″ high sided frying pan with water until near the top. Add salt and vinegar to the water and bring it to a boil. Meanwhile, place the eggs in separate small bowls (coffee mugs work too!). Once the water boils, remove it from the heat and add both eggs at the same time on opposite sides of the pan. Cover the pan with a lid and let sit for 3-1/2 minutes for a soft yolk or 4-1/2 minutes for a firmer yolk. Lift from pan with slotted spoon and serve. 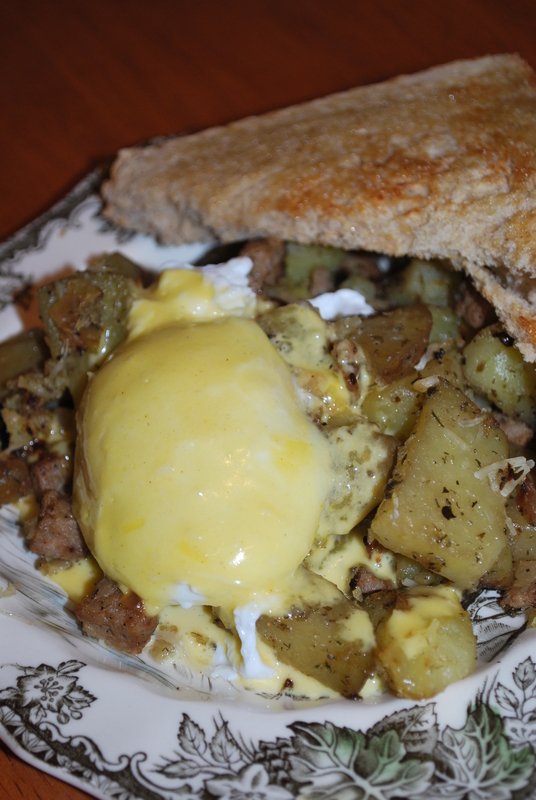 Serve poached eggs on top of the potatoes and top with the Hollandaise sauce immediately before serving. I hope it turned out good for you! 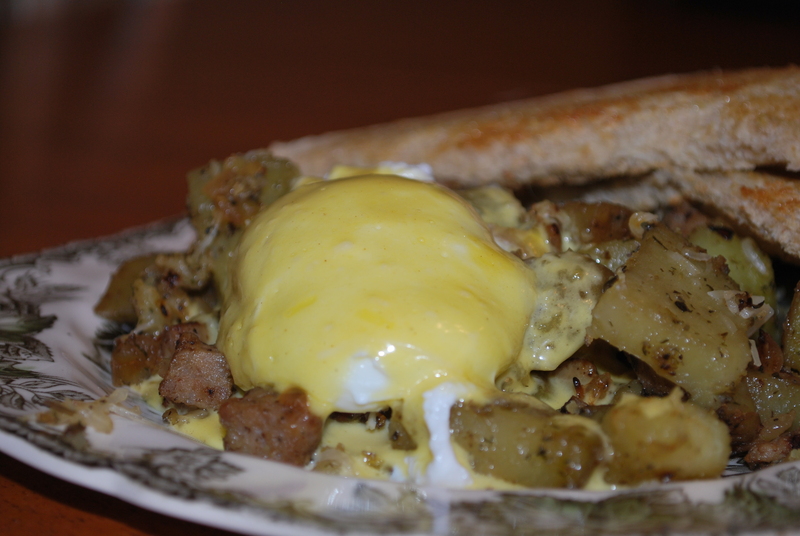 I never knew what made hollandaise sauce- it has always been an enigma to me! my love for it in diners was always enough to carry me through. thanks for sharing!